Spring has finally sprung, which means that it’s time to re-inflate those bike tires and hit the road, but before you do, we want to make sure that you’re practicing the proper precautions. Often, we’re so excited to be back on two wheels that we forget about certain safety measures or riding procedures that need to be followed. When this happens, accidents can result. So, to avoid any potential injuries, we’ve compiled a few tips for you and your family to keep in mind. And in the unfortunate scenario that an accident does occur, we’ve also provided some information about what to do in the event of a personal injury. First and foremost, you should always wear a helmet when riding a bike. It’s estimated that wearing a helmet can reduce the risk of head injury by as much as 50 percent, and in Maryland, all youths aged 15 and under are required to wear a helmet. Yet, despite the fact that 84 percent of bicycle-related deaths occur in persons 20 and older, there is no state-wide helmet requirement for adults in Maryland (although, Sykesville did recently enact a local ordinance requiring helmets for all bicyclists). Regardless of local and state laws (or the lack thereof), you should strive to be a good role model for your children by always wearing your helmet when riding. In 2013, a total of 741 bicyclists were killed in accidents with motor vehicles in the United States, and the majority of these fatalities occurred in the late afternoon and evening. Therefore, it’s important that your bicycle is equipped with a headlight and reflective badges and that you wear bright clothing that is more easily identifiable whenever you are riding. Avoid bicycling on poorly-lit streets after dark, and stay off roads with heavy traffic whenever possible. Additionally, bicyclists are considered motorists in Maryland, which means that you must obey all traffic laws. Be sure to ride on the right side of the road so that you are in unison with traffic rather than riding against it. Also, obey all traffic signs, use proper hand signals, and look both ways before entering traffic or crossing a street. Bicyclists must use bike lanes whenever available unless passing cannot be safely accomplished within the bike lane or when the bike lane is also a right-turn lane. Lastly, many people don’t realize it is illegal to ride a bicycle in Maryland while wearing headphones or earplugs. Just as bicyclists need to be aware of surrounding motorists, drivers need to keep a keen eye on two-wheeled traffic as well. For instance, just as a motorist would pass another driver with ample distance, they must also do so when passing a bicyclist (with at least three feet of clearance according to Maryland state law). When completing the pass, make sure that you have fully cleared the bicyclist and that you can see them in the rear view mirror before merging back into the desired lane. Also, there are several situations in which bicycles have the right-of-way when confronted with motor vehicle traffic. For instance, bicycles have the right-of-way when motor vehicles are turning, so be sure to yield to bicyclists when attempting a turn. They also have the right-of-way when riding in bike lanes or shoulders when drivers are attempting to enter or cross these zones. In short, pass with care, exercise precaution at intersections, and always be on the lookout for children. 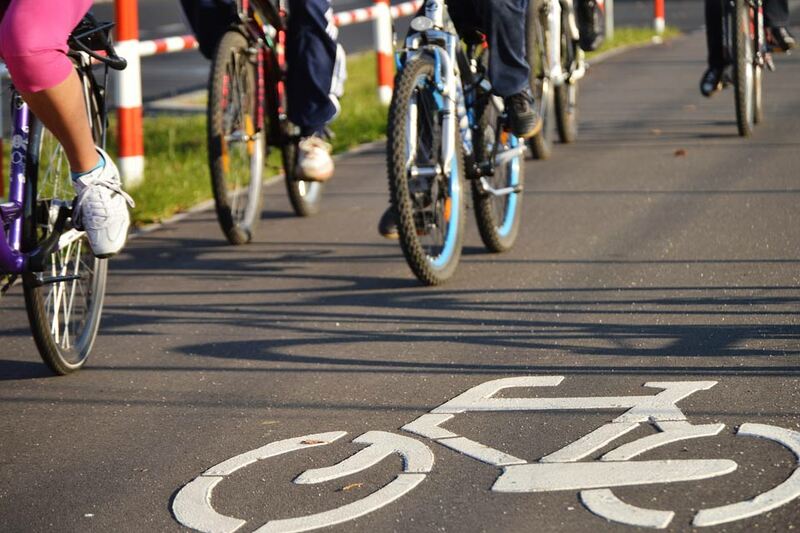 The two most common forms of bicycle accidents with motor vehicles are the left-hand turn and the right hook. The first example occurs when a motorist executing a left-hand turn collides with a bicyclist traveling in the opposite direction. The right hook involves a driver making an ill-advised right-hand turn that impedes the path of a bicyclist, causing a collision. Both of these instances are far more common than you think (as are bike accidents in general), so it’s important to be aware of the proper steps to take following an accident. The first thing you want to check is the health and safety of everyone involved. Once you are sure it is safe to do so, you’ll want to contact the police (and an ambulance, if necessary). By having the proper authorities on the scene, you can ensure that everything will be properly documented when it comes time to file an insurance claim or pursue a personal injury case. Following your discussions with the first responders and police officers, you will want to obtain the motorist’s insurance information, license plate number, address, and phone number of any driver(s) involved. You should also get the contact information of any witnesses who are on the scene and take relevant photos. Never admit fault, and never dismiss your injuries or any damages to your bicycle or equipment. Doing so can only hurt your potential insurance or personal injury claim, even if everything seems fine at the site of the accident. Immediately following the accident, your body will likely be pumping plenty of adrenaline, which could mask certain injuries you might have suffered. It’s best to err on the side of caution and visit the emergency room; it’s possible that you may have serious injuries that could be revealed during the course of a thorough examination by an experienced physician. After visiting a qualified medical professional, you’ll want to take your bicycle to a repair shop for a thorough examination. Again, even if there is no damage immediately apparent, a trained professional will be able to analyze any problems with your bike and document any issues they uncover. This doesn’t necessarily mean that you’ll be getting a beautiful new Cannondale, but insurance companies are required to provide you with market value for your bicycle. While we’re on the topic of insurance companies, never speak with an insurance adjuster before consulting with an attorney first. An insurance adjuster’s primary objective is to mitigate costs and convince victims to settle for a low dollar amount before having the chance to weigh all of the variables. Do not give in to incessant phone calls, emails, or high-pressure tactics; you have the right to speak with an attorney before making a recorded statement, and that is exactly what you should do. In Maryland, when a motor vehicle strikes a bicyclist, the driver’s personal injury protection (PIP) provides benefits to the cyclist. However, if the negligent driver cannot be located or is uninsured, claims can be made to the Maryland Automobile Insurance Fund Unsatisfied Claim and Judgment (UCJ) division. This requires a 180-day notice, but it does provide up to $30,000 in coverage. If you or a loved one has been involved in a bicycle accident – with a motor vehicle or otherwise – please contact the Pinder Plotkin legal team today. Our attorneys have a wealth of knowledge and experience in personal injury and are prepared to pursue your case professionally and aggressively. We will work hard to recover all medical expenses resulting from the accident as well as any present or future loss of income. Please call us today at (410) 661-9440 or visit our website to receive a free consultation regarding your legal issues.